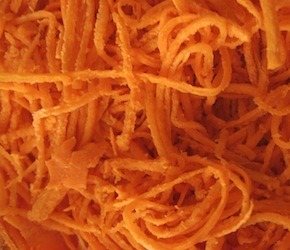 In a food processor, grate carrots and cabbage. Add to a large bowl and stir well with your hands while adding in the salt and cumin seeds. Try to rub the salt into the veggies as best you can. Add the mixture to a fermentation crock or divide it amongst wide-mouthed mason jars (leaving about an inch of space at the top). If using the jars, pound down the veggies so that they sit below the level of the liquid. Cover jars tightly and leave in a dark place at room temperature for 3 days. (Note: some people like to “burp” their fermentations periodically to avoid too much pressure building. You can get rubber-sealed lids, like Weck jars, that allow some gases to escape keeping the pressure constant). If using a crock, you need to make sure the level of liquid rises above the top of the veggies. This can take awhile, as the salt draws moisture out of the vegetables, so it’s best to leave the crock, unsealed, for 24 hours to make sure the water level rises. If it doesn’t get high enough, add filtered water until just above the veg. Add the weights, place on the lid and add water to the water seal. Leave at room temperature for 10 – 14 days. Pair with meat or vegetable dishes as a condiment to add flavour and increase nutrition and digestibility.